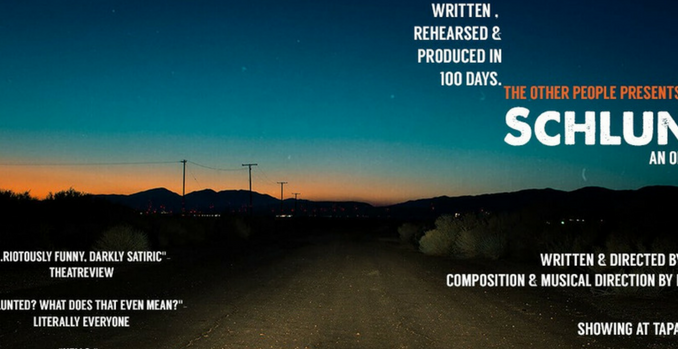 Writing, composing and directing a full-length musical in 100 days is no easy task. Schlunted follows a group of young twenty somethings driving off on a road trip after Fi (Sinead Fitzgerald) calls up her two high-school best friends, Hailee (Sally Brady) and Chris (Hadley R Taylor), who have both just completed their university degrees. However, this is no joyous reunion, Hailee only comes reluctantly along with her highly-strung partner Wally (Bernie Voice) in tow, and Chris is guilted into joining. After a fleeting glance into their high school relationships via a nostalgic tune, disaster strikes and the trip takes a turn for the morbid. It is a strong set up for a farcical adventure, but something doesn’t quite sit right. The character reactions fail to accurately match the gravity of the situation and there is ill timed character development, such as Wally’s showering song, that feels clunky and out of place after a huge disaster. Usually musicals can get away with barely-there storylines due to the strength of the music, however, the composition in Schlunted isn’t enough to save this plot. That’s not to say there aren’t some redeeming moments in the production. The cast are a talented bunch, with particularly strong performances from Sally Brady, Jocelyn Scott, and Brady Peeti who claim the stage whenever they open their mouths to sing. Both Brady and Peeti sing enchanting solo pieces that cause raucous applause. The few duets are sung wonderfully with great harmonies, and could have been utilised further with more songs combining multiple voices. With over twenty songs the trajectory becomes predictable and prescriptive as the show goes on. But the biggest issue starts and ends with the script, which unfortunately causes the show to drag through its 2.5 hour run time. The dialogue is too expositional, and some characters too two-dimensional and leave much to be desired. Lack of clarity in the writing leads to some awkward moments, raising questions of tastefulness surrounding issues such as coming out and disability. Without a clear sense of the humour they are trying to achieve they find themselves on thin ice. A full musical in 100 days from conception to stage is an impressive feat and is nothing to be sniffed at. It’s incredibly encouraging to see more and more kiwis tackling the challenge of bringing musicals to the smaller stages of Aotearoa. 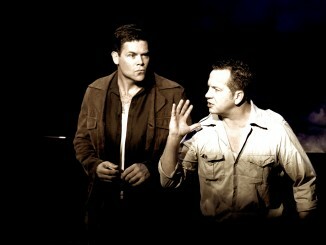 Schlunted was presented by The Other People and played at TAPAC 2-5 November. Details see TAPAC.